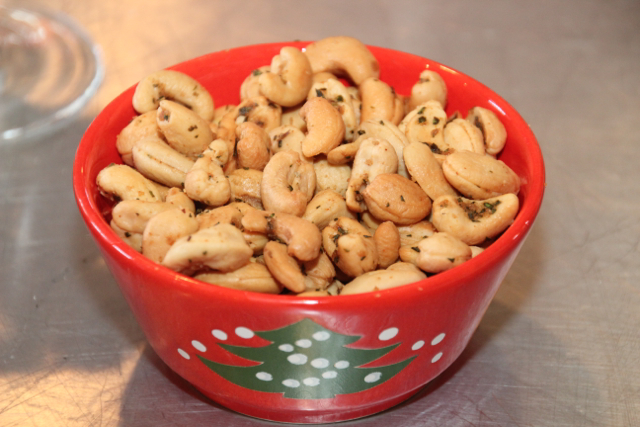 Well it’s Holiday season and to me, nothing says holiday appetizer like Rosemary Cashews. 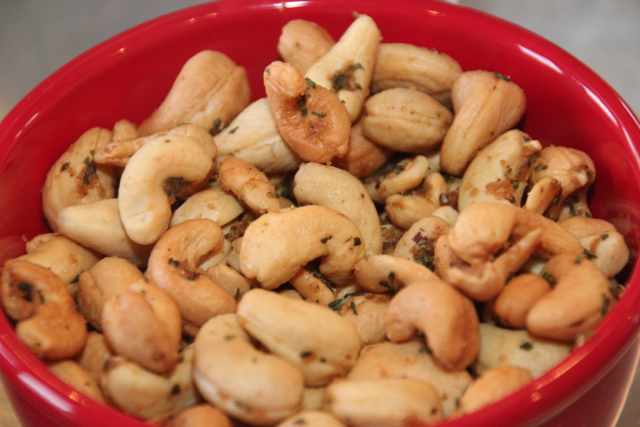 My good friend Velda came to a Christmas party at my home several years ago and enlightened me as to the wonderfully unique flavor these cashews have as well as how simple they are to make. The rosemary adds a flavor like nothing else, and then you add to that, the saltiness and the slight kick from the ceyenne pepper and WOW! Thank you Velda . . . your legacy lives on! 4 In a large bowl, combine the rosemary, cayenne, sugar, salt and butter. Wasn’t that easy?! Be sure you have this recipe handy when you serve these lest your guests will stalk you to get it! As always, thank you for reading and Merry Christmas and Happy Holidays! A super supplement to any meal is this Grilled Bearnaise Bread. You don’t have to heat it on the grill, an oven will work fine. It’s got a snappy flavor and will round out most any meal. We made this at our last grilling class and I usually look forward to some of the left-overs . . . not this bread! 1. Combine the vinegar, vermouth, shallots, tarragon and cracked pepper in a saucepan. 2. Cook over medium heat until the liquid is almost evaporated and the sauce is reduced, stirring occasionally. Remove from heat. Let stand until cool. 3. Combine the cooled sauce and butter in a food processor bowl fitted with a steel blade. Process until smooth. Season with salt. 4. Spread 1 side of 10 slices of the bread with some of the béarnaise butter. 5. Arrange the slices together to form a small loaf and wrap lightly in foil. 6. 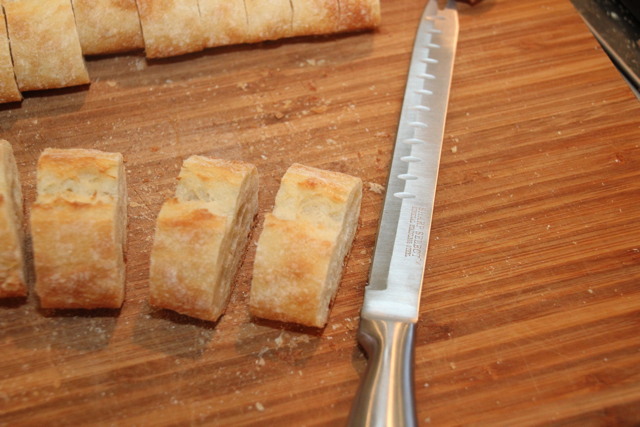 Repeat the process with the remaining bread slices and remaining butter. 7. Bake at 375 Degrees for 15 minutes or until heated through. As always, thank you for following and reading! Check Our Website for information about our Next Gourmet Cooking Class. Also, don’t forget, now is one of the best times to Visit The Flint Hills of Kansas! Remember, when you are at The Lark Inn Guesthouses, you don’t have to go anywhere to visit The Flint Hills . . . You’re There! A lot of people think they don’t like lamb. I don’t either the way some people prepare it!We fixed our “Fred’s Rub” grilled pork chops at a dinner party a couple of months ago and they were a big hit! At the party , one of our friends walked up to me with lamb chop bone in hand and asked, “what is this?” I told her it was grilled Fred’s Rub lamb. She assured me is couldn’t be lamb because she didn’t like lamb and “this is fantastic!” That’s where we came up with the slogan . . . if you haven’t tried Fred’s Rub Lamb . . . you haven’t really tried lamb! As for the Fred’s Rub . . . my father-in-law was one of the pioneer grillers back in the 50’s and 60’s. He came up with a spice mix of garlic powder, seasoned salt and pepper. To my surprise, it is really quite good on everything from steaks to chops, chicken, veggies and even fish. You just have to vary the amount you use given the heaviness of the food you are preparing. In his honor, my husband Pat has put Fred’s Rub together in shaker bottles and labeled it as “Fred’s Rub”. 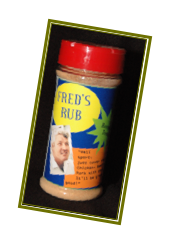 If you would like to try it, just contact me and for $5.00 plus shipping you too can be a Fred’s Rub addict. Rinse lamb chops with water and dab the excess water off with a paper towel. Sprinkle a fairly liberal amount of “Fred’s Rub” over the chops, taking care to completely cover them only on one side. 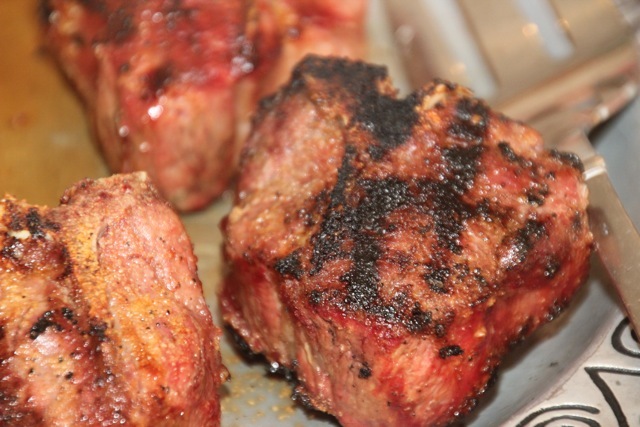 Place the chops over a medium hot grill (around 300 – 350 degrees) with the “Fred’s Rub” side down. Allow to sear for 3 – 5 minutes and turn. Grill on second side until the internal temperature of the chop reaches 140 on an instant read meat thermometer. This will be medium rare and will produce the best flavor. Overcooked lamb is the reason so many people “don’t like lamb”! 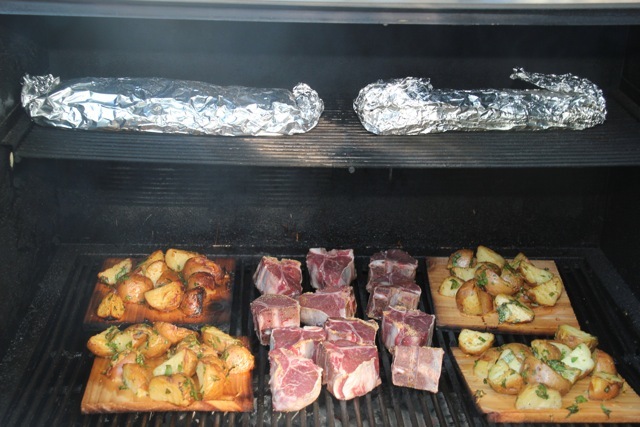 Remove the lamb chops, wrap in foil and allow to rest for at least 10 minutes before serving! That’s it! Aren’t those simple?! You amy want to try these at your next tailgating party! For more information about our next cooking classes or to order your Fred’s Rub, Just Go To Our Web Site. What a wonderful dessert! It’s simple to do, looks great and it’s not bad on calories! What more can you ask for! Again, we prepared this at our last cooking class and it was a hit! At least it was as much of a hit as any dessert can be after an afternoon of cooking and eating. But really, it was perfect for that because it it is not too heavy and will work well as the final chapter to any meal. 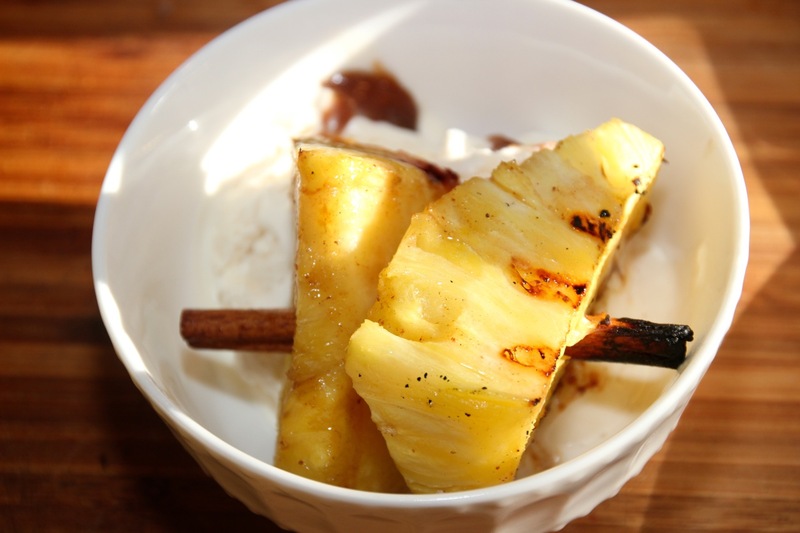 Using a metal skewer, made a starter hole in the center of each piece of the pineapple, skewer 2-3 pineapple chunks on each cinnamon stick. Combine the butter, sugar, bourbon, ground cinnamon, cloves and salt in a saucepan and boil until thick and syrupy, about 5 minutes. Preheat the grill to high. Clean and oil the grate. Grill the pineapple until nicely browned on both sides, 3 to 4 minutes per side, basting with the bourbon glaze. Serve at once over vanilla ice cream. Visit Our Website for information about our next cooking class at The Lark Inn. Also, for a great get-a-way in the heart of The Flint Hills of Kansas Check Us Out! 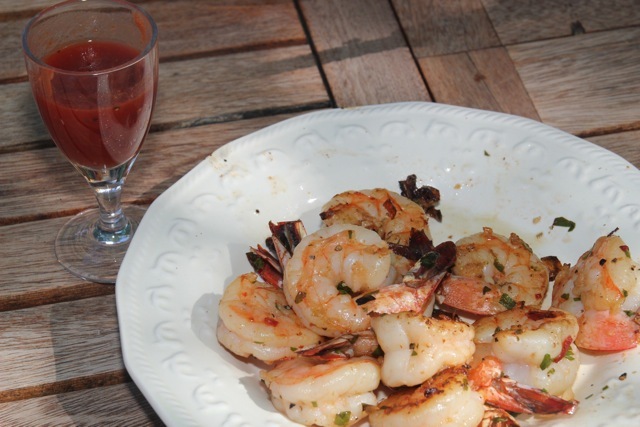 This is a relatively simple but fabulous tasting grilling recipe we learned about while attending a cooking class at “Our House” in San Juan Capistrano, California. This is great as an appetizer or if you be sure to make enough of them, they would be great as a main event! Place the shrimp, cilantro or parsley, garlic, minced chipotle with juices, salt and pepper in a mixing bowl and toss to mix. Stir in the oil and lime juice and let marinate for 30 minutes. Grill on hot fire in grill basket for 3-4 minutes until shrimp turns pink. Place all of the above ingredients in a mixing bowl and whisk to combine. Correct the seasoning, adding salt and/or lime juice to taste. Serve with the shrimp. 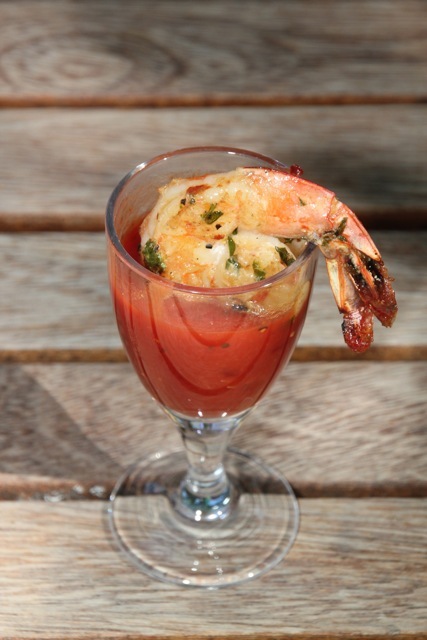 You can have a lot of fun with the presentation of shrimp; hook one over the edge of a small cocktail glass filled with cocktail sauce, or hook several around the edge of a small bowl (tulip or similar) filled with coctail sauce. Or something else I have done for large groups is to arrange the shrimp decoratively on a large platter with a small bowl of the cocktail sauce in the center or on the side. This allows for your guests to serve themselves. Visit Our Web Site for information about our next cooking class and relaxing, serene guesthouses right in the Flint Hills of Kansas! This is a fabulous recipe we did at our last grilling class. I know, this is the second recipe from that grilling class and nothing yet has been grilled! Well, the grilled stuff is coming. With our weather so gloriously changing to fall and, our good tomato supply rapidly depleting, I wanted to get this recipe to you as soon as possible. This tomato salad has a rich flavor but not rich body. Actually, it is very light but packed with flavor. Well, before your tomatoes go bad, let’s get started! 1. In a medium bowl, combine the shallots, garlic, vinegar and 1 teaspoon of salt; let stand for 5 minutes. 2. Add the lemon juice and season with pepper. Break up the basil springs and add them to the bowl. 3. Whisk in the oil and let stand for 10 minutes, discard the basil springs. 4. Spoon one-quarter of the vinaigrette onto a large shallow platter. Arrange half of the tomato slices in overlapping circles on the platter and season with salt and pepper. 5. 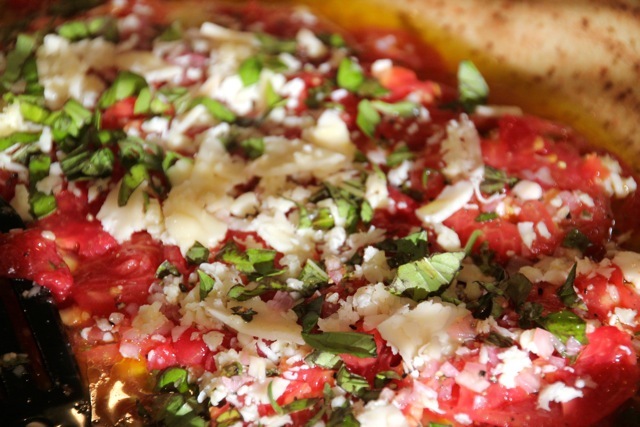 Using a sturdy vegetable peeler, shave half of the provolone over the tomatoes. 6. Spoon half of the remaining vinaigrette on top and sprinkle with half of the chopped basil. 7. Repeat with the remaining tomatoes, cheese vinaigrette and basil, seasoning with salt and pepper between layers. 8. Cover with plastic wrap and refrigerate for 2 hours before serving. And there you have it! This is excellent just by itself on a plate for for you tomato sandwich lovers out there, try it on some savory toasted bread. As always, thank you for following and for your support! For information about our next cooking class at The Lark Inn please Check Our Website. Also, don’t forget that The Flint Hills of Kansas are awesome this time of year. Check us Out and kick back and relax! I know it seems funny but at our last “grilling” class one of our main menu items was stuffed grape leaves . . . NON-Grilled! Several years ago, my cousin married a man whose family tradition it is to make stuffed grape leaves. Just a bit of education here; though there are little differences, Stuffed Grape Leaves is how the Persian culture refers to these and Dolmas is what the Greek culture calls them. Anyway, through the years I have spent many an hour with family members gathered around a kitchen table rolling grape leaves and just catching up. It is really a a wonderful way to spend an afternoon. Then . . . you get to enjoy eating them!! 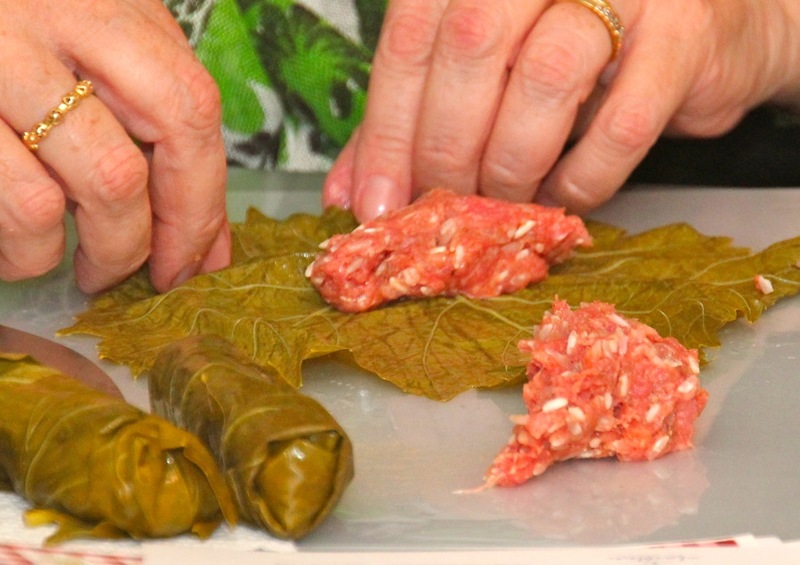 In our class we made our stuffed grape leaves with ground beef. Depending where you live and your availability to ground lamb I would suggest that you try that also. My favorite is a 50/50 mixture of ground beef and ground lamb. In a large mixing bowl, mix together the ground beef, rice, garlic powder, allspice, salt, pepper, and cinnamon, and set aside. Rinse grape leaves several times. If the leaves are small, leave them intact, but cut out the large center vein. If the leaves are large, cut them in half vertically, cutting out the large vein in the process. Place a small amount of the ground meat mixture at the end of each leaf. Roll up egg-roll style. Pour the oil into the bottom of a large Dutch oven. Lay the chops over the oil. Lay the tomato slices over the chops. Place the stuffed grape leaves seam-side down on top of the chops. Pack the leaves tightly and begin a second layer when necessary. Place whole garlic cloves randomly between the rolled leaves; plenty of garlic on each layer. When you are done stacking, pour the lemon juice over the leaves, and add water to the pot to about 2-inches above the rolled leaves. To prevent the leaves from unrolling during cooking, place a plate on top of the stack of leaves and place a heavy object on top of the plate. Simmer the leaves over low heat for about 2 hours. Follow the directions abo ve but in a pressure cooker. 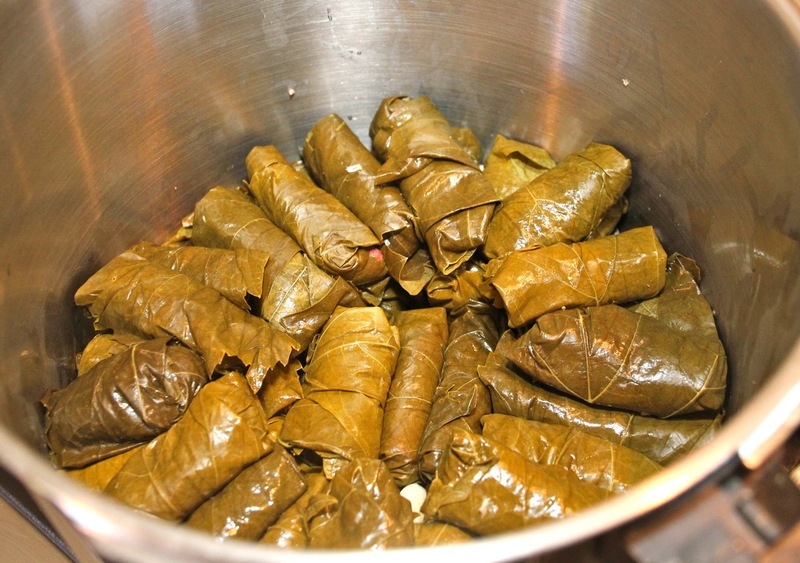 After all of the rolled grape leaves are placed into the pressure cooker with all the other ingredients, fit the lid into place tightly and place over high heat. Heat until steam begins to escape from the steam vent and lower heat to simmer. Simmer for 20 – 25 minutes making sure that steam continues to escape from the vent during the simmer time. Grapes leaves are wonderful to eat just by themselves. 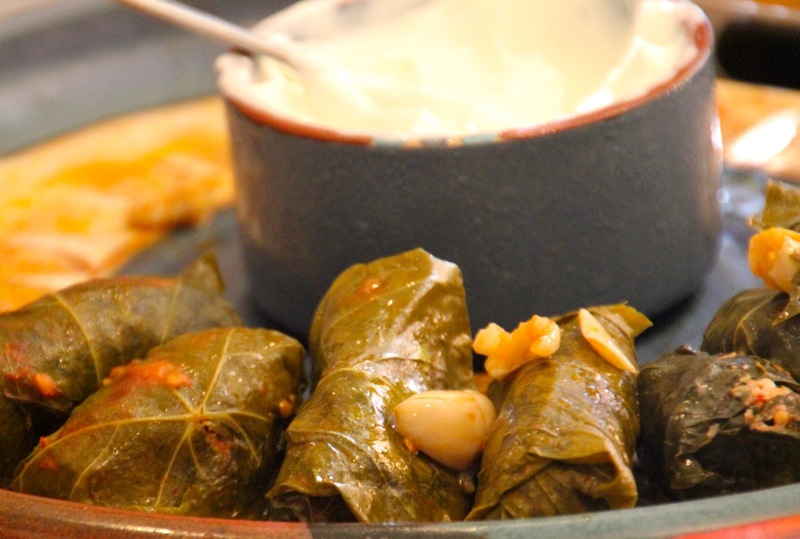 But if you want to add some variety, serve your grape leaves with Greek yogurt. Now for the best part; Serve and Enjoy! For more information about upcoming cooking classes at The Lark Inn or for a great place to escape the rigors of the city and just chill out Visit our Website.